Finally, peace and quiet! After a week and a half of listening to the pump evacuate the groundwater out of the soon to be pool in our backyard, I can finally enjoy the birds chirping and the squeals of my kid’s voices as they play. Whether inside or out, the pump was a rather obtrusive sound. A lot can be said for double-pane windows, but I wouldn’t know since ours are single. Silence is a beautiful thing and I’m hoping my neighbors aren’t too upset. The steel work was completed in two or three days by two highly skilled men. The shell of the pool and spa was “shot” first thing Monday morning and I have to say, I really enjoyed watching these artists create a masterpiece. I watched for hours as one man randomly shot cement from a hose and created walls, steps, a sun shelf, and a platform without any guides while four or five other men contoured and smoothed. What was once a mound of cement in the bottom of the pool is now a 4.5 ft sun shelf with 3 additional steps that were sculpted with ease. If you remember from a previous blog, the dirt swim shelf collapsed leaving the only option being to use solid cement. It’s amazing what they created without any models or forms. After only 5 hours of drying, the kids were already running around in the shell of the pool. It looks great and the best part, the pump was turned off by 8 am the following morning. The groundwater will now be allowed into the pool to prevent the shell from popping out of the ground. However, it’s been 48 hours and I haven’t seen any water quite yet, but I’m sure it will soon make an appearance. After all, it poured out of the pipe for over a week so I know it’s down there somewhere. On Tuesday, the surrounding pool area was backfilled from the mountains of dirt strategically placed all over our back yard. We had a relatively flat yard and it was great, but that was short-lived. First thing Wednesday morning the workers arrived and trenched the entire area for the plumbing. We now have mountains of dirt again leading all the way around the pool to the back of our home where the pump, heater and filter will soon be located. We’re making lots of progress! 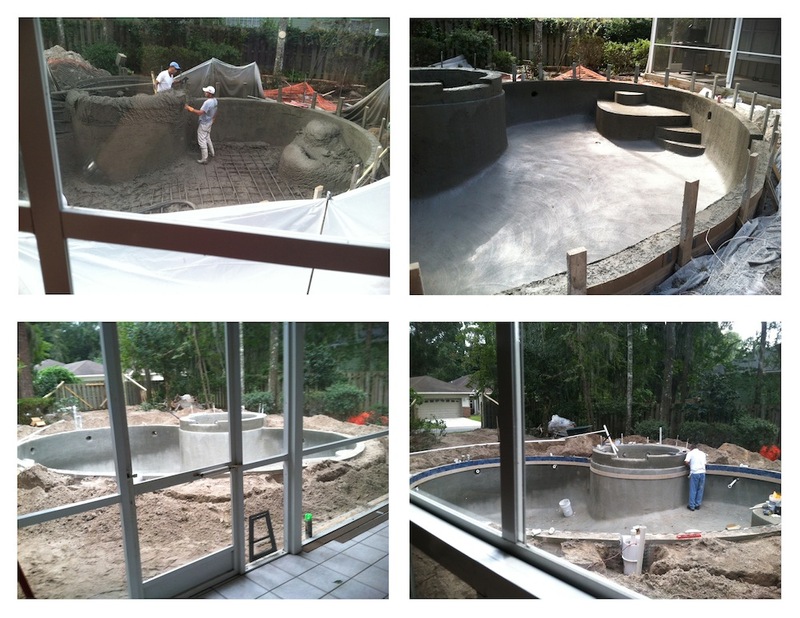 The same day the trench work began, the waterline tile work started in the pool and spa. My pool designer asked me to pick grout for the tile because it would be needed in the next few days. Simple enough, right? Without hesitation, I asked him to bring me shades of blue/gray as I want it to blend in with the tile rather than frame it. Unfortunately, he tells me true blue is nearly impossible to locate and I better find a gray that will work. After an hour of standing in the pool with six 2” sample plastic grout strips, we decided on mist. Again, I feel like I’m randomly making selections not knowing if everything will tie together nicely at the end. The tile work and grout was completed in only a few days and, by itself, it looks great. I’m hoping the ivory travertine coping, stacked stone for the spa and the sand dune pavers I selected coordinate nicely, fingers crossed because there is no changing my mind. It will all be worth it Michelle. Your kids are like fish and will get tons of joy out of having their own pool.